Are you looking for the high-quality electric winch for your trailer, UTV, or side-by-side? 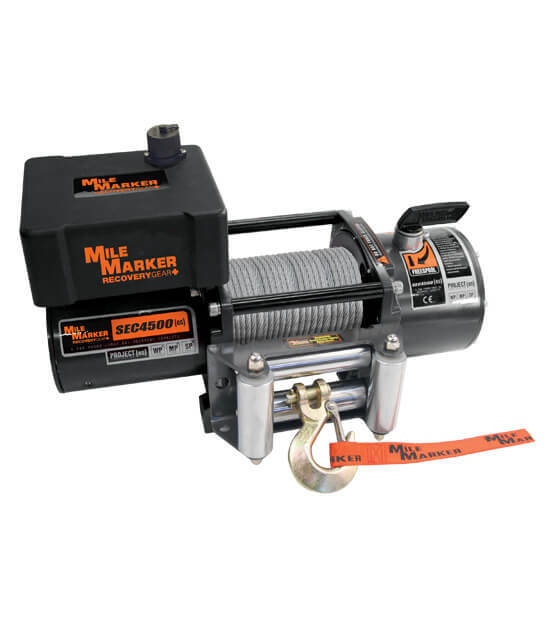 Check Mile Marker SEC 4500 (es) electric winch with the 4500 lbs capacity. This device belongs to premium winches, which are able to provide you with fast recovery and reliable performance whenever you are in trouble. Do you wonder whether it is the best option for your side-by-side? Then, check how you can benefit from using this winch by reading this detailed review. To know whether this winch is a good option for you, check the specifications. So, let’s have a closer look at the characteristics of Mile Marker winch. As it has already been mentioned in the very beginning, the pulling power of the winch is 4500 lbs. It is sufficient for getting out in case your side-by-side or trailer gets stuck suddenly. The winch itself weighs not much – 59 lbs. Thanks to the high-grade sealing technology that has been used for the winch construction, it can boast the highest quality operation. You shouldn’t be afraid of water or mud when planning off-road adventures. This is due to the fact that this model is premium sealed and it is completely water – and mudproof. You will be impressed by the speedy work of the winch that is provided by the magnetic motor and a marine grade remote control. Off-road lovers will appreciate the presence of the 3-Stage Planetary Gear that is made of solid metal, thanks to which you can enjoy the durability of the device. Moreover, the discussed winch model is equipped with hooks, galvanized fairleads, and a frame that is resistant to corrosion. The reviewed model has a lot of advantages, the first one of which is definitely its producer known for the highest quality of winch parts as well as the innovative stylish look. We have already checked the main specifications of the winch. Now, let’s outline what features can be considered the obvious advantages of Mile Marker 4500. The winch has many pros, among which you will enjoy its property to provide you with the fast recovery most of all. Are there any cons? As you know nothing is 100% perfect and at least one small disadvantage can be found almost in all cases. What about Mile Marker 4500? Some winch owners admit that the need to have a special glove to handle a rope made of steel may be considered a small con. However, there are no other disadvantages that have ever been found by the winch owners. Should You Give Preference to Mile Marker SEC 4500? After the research and analysis of the winch features, it is possible to conclude that this device is definitely worth your attention. It will be a great choice for your trailer or side-by-side. This winch has everything you may need when facing extreme situations. If you plan to use a winch often, this option will serve you for long. It can be your reliable helper in exploring new terrains. The winch is able to take care of your safety providing the best off-road experience! It was snowing hard but the winch was able to get my side-by-side out without any problems. Choose it as it is really great!